Well it’s past midnight, making it the 16th October and Dad’s birthday. Hurrah! I just caught More4’s repeat of The Deal (huge thanks to Mr X for alerting me to it minutes before!) Great stuff – steeped deep in Labour Party mythology now I think, just as Helestine vs Thatcher is embedded in Tory memories. Watching the scenes of Labour in opposition was quite moving actually. Even if it wasn’t my generation. I’ve changed my mind about the Tory leadership contest by the way – Cameron would be the best PM of the candidates, and the one Labour should be most worried about. Clarke is yesterday’s man. The drugs question shows Cameron to be principled. He has defended his right to have a private life, and quite rightly. He has also supported drug law reform, sometimes against his own party. I think he shows even the Conservatives can move on from Thatcherism. And what could be more hopeful that, whichever party wins the next election, we will never return to those days? 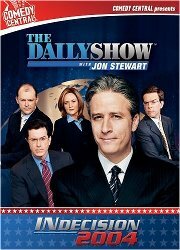 I’ve been watching The Daily Show: INdecision 2004 DVDs today (well, yesterday) which despite being laugh-out-loud funny as usual, is a reminder of what happens when politics goes horribly wrong. Depressing.